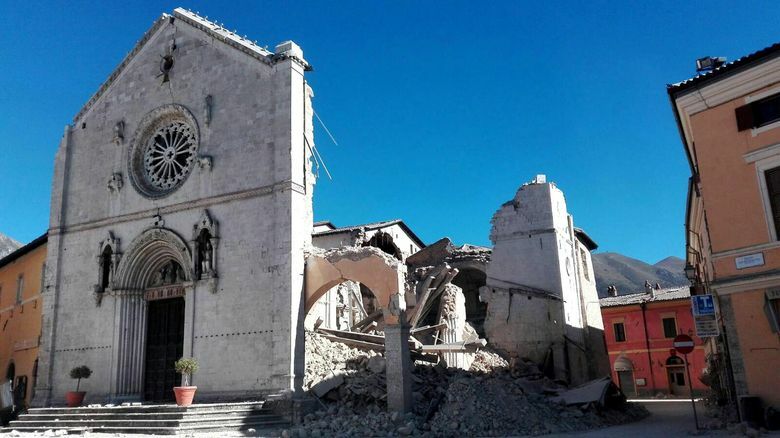 NORCIA, Italy (AP) — The third powerful earthquake to hit Italy in two months spared human life Sunday but struck at the nation’s identity, destroying a Benedictine cathedral, a medieval tower and other beloved landmarks that had survived the earlier jolts across a mountainous region of small historic towns. Lost or severely damaged in the shaking were ancient Roman walls, Gothic and Baroque churches and centuries-old paintings crushed beneath tons of brick, sandstone and marble. Italian Premier Matteo Renzi said the nation’s “soul is disturbed” by the series of quakes, starting with the deadly Aug. 24 event that killed nearly 300 people, two back-to-back temblors on Oct. 26, and the biggest of them all, a 6.6-magnitude quake that shook people out of bed Sunday morning. It was the strongest quake to hit Italy in 36 years. There were no reports of fatalities — a fact attributed to the evacuation of sensitive areas and fragile city centers. 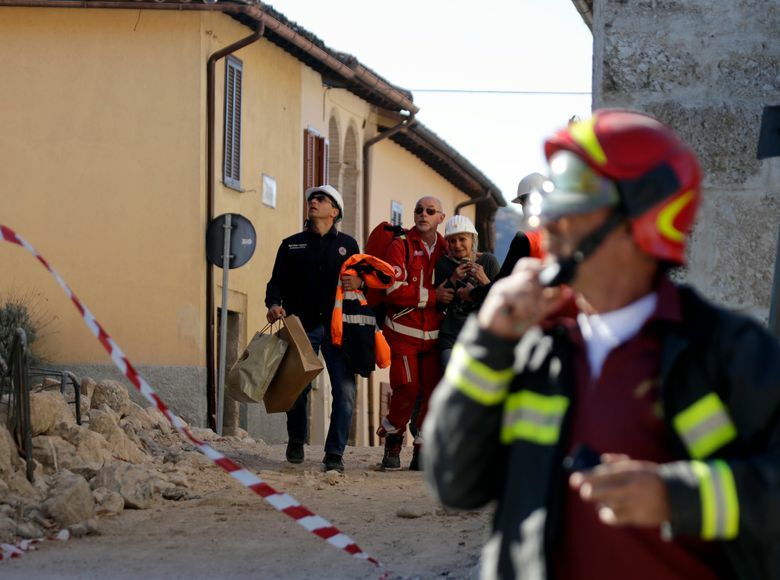 Nearly 8,000 people have been moved to shelters or hotels following the quakes last week and Sunday, and Italy’s Civil Protection agency was expecting that number to reach 11,000 by Monday morning. Many who stayed behind were sleeping in campers or other vehicles, out of harm’s way. “Feeling the earth collapse beneath your feet is not a metaphorical expression but is what happened this morning, and half of Italy felt this,” Renzi said. The quake struck another painful blow to the rich artistic heritage of villages that dot the Apennine Mountains. The worst damage was reported in Norcia, a town in Umbria closest to the epicenter. Two churches were destroyed — the 14th century Basilica of St. Benedict, built on the traditional birthplace of St. Benedict, founder of the Benedictine monastic order; and the Cathedral of St. Mary Argentea, known for its 15th century frescoes. Only the cracked facades were still standing, with most of the structures disintegrating into piles of rubble and dust. Television images showed nuns rushing into the main piazza as the bell tower appeared on the verge of collapse. Later, nuns and monks knelt in prayer in the main piazza. A firefighter appealed to a priest to help keep residents calm in an effort to prevent them from looking for loved ones. When the quake stuck, nuns from the Saint Mary of Peace monastery in Norcia were praying and singing hymns. The shaking caused their building to collapse and badly damaged their sleeping quarters. Later, firefighters escorted them back inside to retrieve holy books. Then an aftershock hit. “But we had courage, because we were in our house and the Lord protects us,” one nun told The Associated Press. Large sections of Norcia’s ancient Roman city walls — which suffered damage and cracks in the previous quakes — crumbled, along with towers. 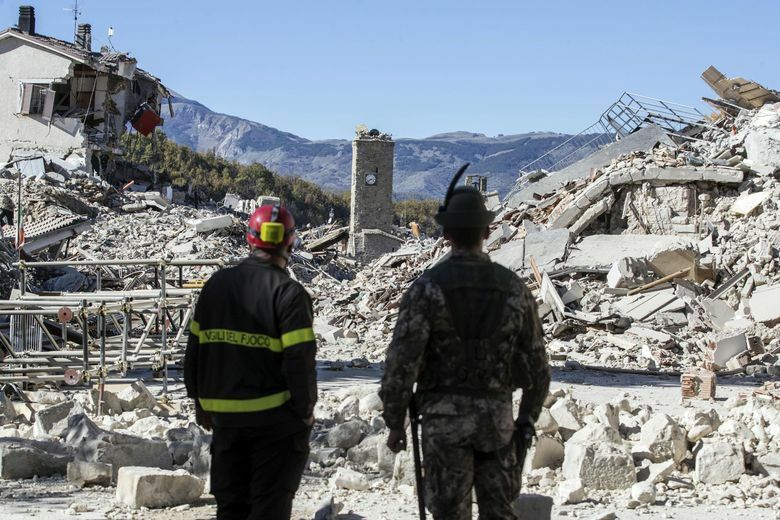 Amatrice, the town that bore the brunt of destruction on Aug. 24, sustained blows to treasures that had withstood the quakes of the past weeks. 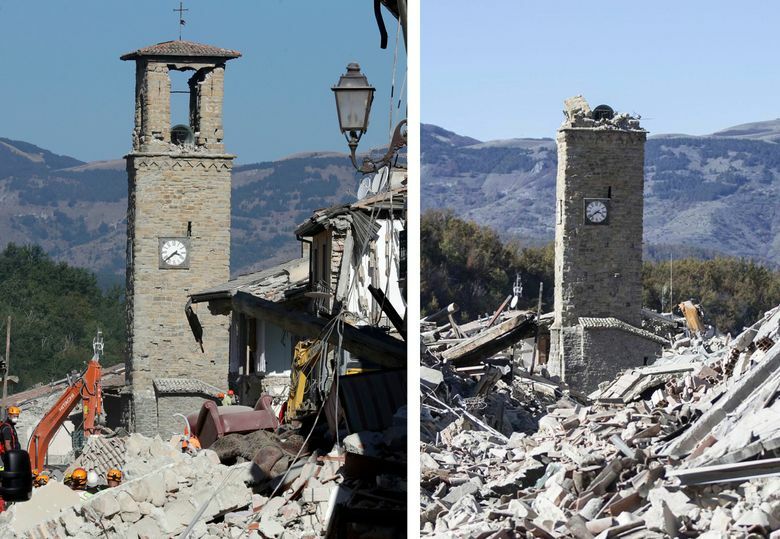 The community’s medieval bell tower stood tall amid the rubble after the August quake, becoming a symbol of hope and resilience for the stricken population. During a visit to the quake zone earlier this month, the pope prayed alone amid the rubble, the brick tower still standing in the background. But the latest shaking partially collapsed it. The 15th century Church of Sant’Agostino also fell down. “The monster is still there,” Amatrice Mayor Sergio Pirozzi told Sky TG24. The quake was felt as far north as Salzburg, Austria, and all the way down the Italian peninsula to the Puglia region, the heel of the boot. 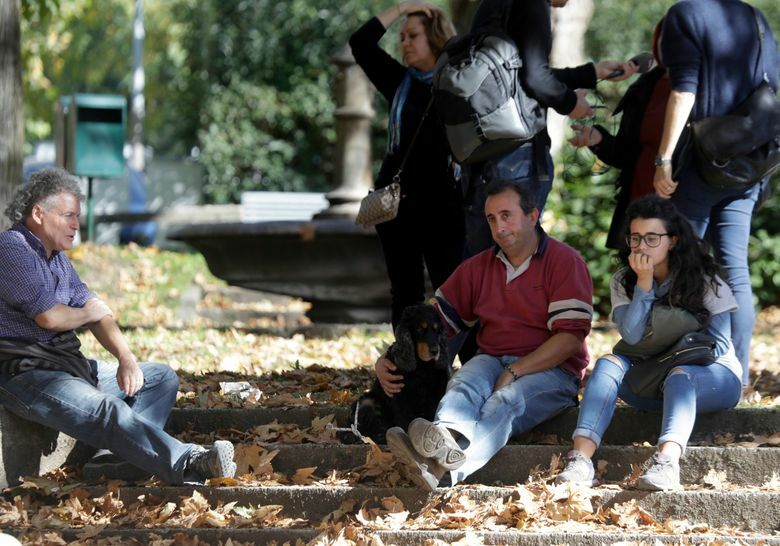 In Rome, some 150 kilometers (95 miles) away, people rushed into the streets in pajamas. The basilica of St. Paul Outside the Walls, a site of Christian worship in Rome since the 4th century, had to be closed for inspections after sustaining cracks and damage to some molding. There were also cracks in the cupola of Sant’Ivo alla Sapienza church in Rome, a baroque masterpiece by Francesco Borromini, an architectural giant of the 17th century. The quake forced the temporary closure of some of Rome’s most important tourist sites, including the presidential palace, so authorities could check for damage. The crowds in St. Peter’s Square interrupted Pope Francis with applause when he mentioned the quake during his weekly Sunday blessing. “I’m praying for the injured and the families who have suffered the most damage, as well as for rescue and first aid workers,” he said. 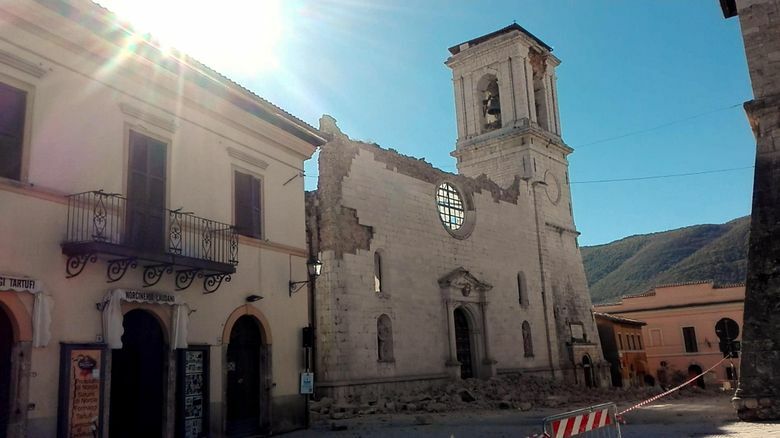 ANSA reported that the quake damaged the church of St. Joseph in Jesi, a town encircled by medieval walls southwest of the coastal city of Ancona. The roof caved in partially and cracks appeared near the altar. 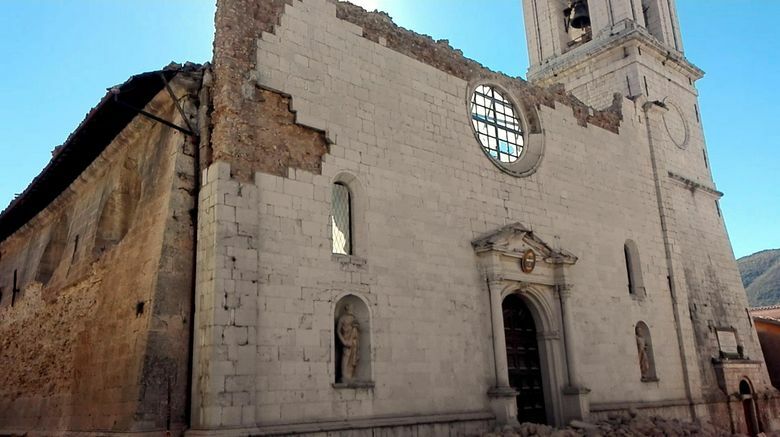 In Tolentino, there was visible damage to the Cathedral of San Catervo and the Basilica of St. Nicolas, which contains artwork and architectural elements dating from the 14th to the 17th centuries. With a preliminary magnitude of 6.6, it was the strongest earthquake since a 6.9 temblor near Naples killed some 3,000 people on Nov. 23, 1980. Some 20 people suffered mostly minor injuries. Authorities responded with helicopters to help the injured and monitor collapses, as many roads were blocked by landslides. The Salaria highway, one of the main highways in the region, was closed at certain points. Some local rail lines in Umbria and Le Marche were also closed as a precaution. 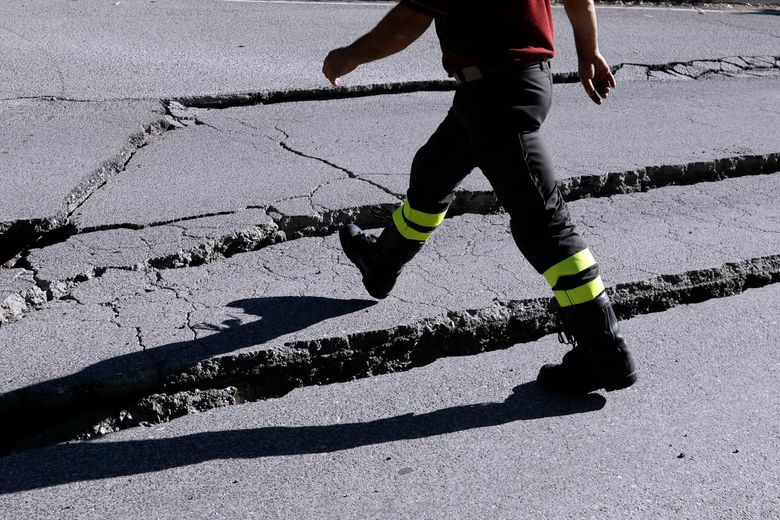 Seismologists said the shaking came from a series of faults in the Apennines, and they could not rule out more, possibly stronger quakes in the near future. 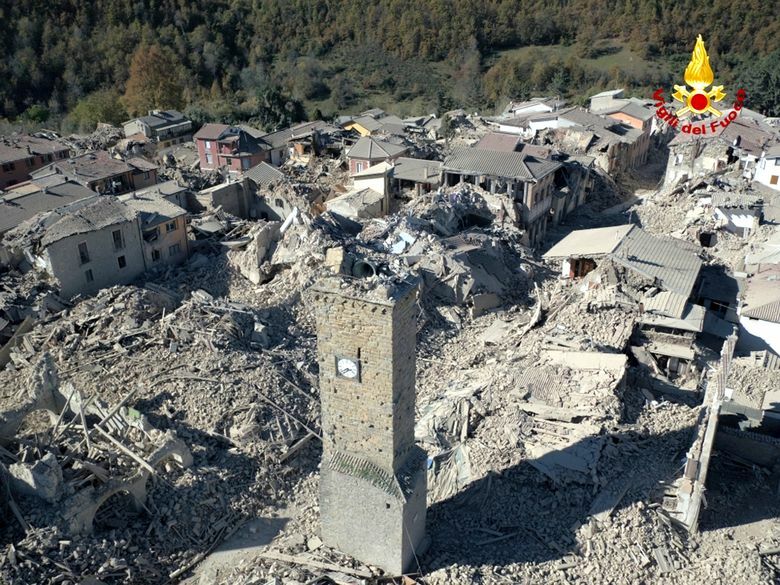 “It is normal for the Apennines,” said the president of Italy’s National Institute for Geophysics and Vulcanology, Carlo Doglioni. He cited a similar sequence of three events within a period of months in 1703 in the region. Natural law dictates that after such an event there will be more quakes, “which means we can expect some 5 magnitude quakes and many of magnitude 4,” Doglioni said. Already on Sunday, more than 200 other seismic events were recorded by the institute, including 15 temblors between magnitude 4 and 5. Barry reported from Milan and Gera from Warsaw, Poland.